There is no place like your own home. A well-designed kitchen is every homeowner’s dream. You can now fulfill your idea of having a perfect kitchen with CozyHome custom kitchen cabinets and designs. Who doesn’t like a well-designed kitchen that is all done up according to your taste and preference! Most Toronto homeowners will agree that their family activities usually take place in the kitchen area of their home. Then why not beautify this space perfectly so you can cherish each moment spent in the heart of your house! CozyHome, designs manufactures and installs custom kitchen cabinets from its diverse range of cabinets to ensure you have exactly what you want and need. In Toronto, a well-designed kitchen can upturn the value of a home by up to 30%. This isn’t just rewarding for the owner of the house but adds to the functional and visual aspects of the home. CozyHome is committed to providing its Toronto customers with the highest quality customized kitchen renovations at reasonable prices. Our team of experts can help you achieve all your kitchen goals and create a perfect kitchen of your dreams – a contemporary designer kitchen or a classic traditional one. They can do it all. If remodelling your kitchen is on your mind, call us today. We serve clients in Toronto and GTA. You can book a free design consultation, check out your 3D kitchen design, get a free quotation and find out how much you’re saving! CozyHome ensures having your dream kitchen isn’t a time-consuming process. Now you won’t have to wait months to have your fantasy kitchen ready. The team of experts at CozyHome works extra hard to make sure that every client gets the fastest delivery. We take anywhere between one to two weeks for our entire remodelling process – from the first step of designing to the last stage of handing over your wholly renovated kitchen. This is a natural first step. Book an appointment with an in-house designer at CozyHome. All you need to bring along with you are the approximate dimensions of your home kitchen. You can then discuss your preferences for your kitchen and the kind of custom kitchen cabinets you want with our designer who will create a free 3D kitchen design tailor-made according to your liking. This 3D design will help you visualize how your Toronto home kitchen will appear after renovation. Once you have approved a design for your kitchen and given all your requirements, our technician will come over to your home to take professional measurements of your kitchen to start working on the kitchen cabinets. CozyHome’s creative design team will recreate your final design according to the correct measurements of your home kitchen in Toronto. 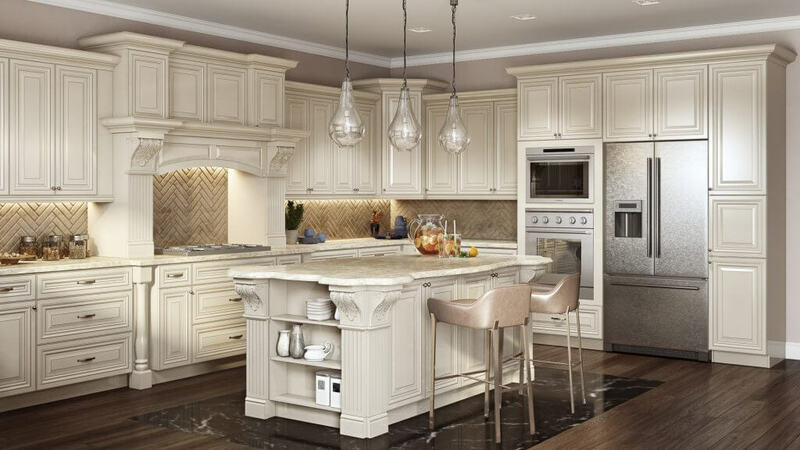 After your customized cabinets are manufactured and ready, our team of professional installers will deliver and install your new kitchen in your house and complete the renovation process as promised. You finally have your dream kitchen all set up in your Toronto home. It’s time you can go ahead and enjoy your newly renovated kitchen. Unlike other services, CozyHome takes one to two weeks for the whole renovation process of your kitchen – right from planning and design to installation completion. CozyHome’s line of pre-made and ready-to-assemble cabinets has the same effect as their customized ones. You won’t be required to sacrifice on the quality of your customized kitchen cabinets, and you can make the most of your dream kitchen. At CozyHomes, you will find exactly what you have been looking for! It hardly matters if your fantasy kitchen is a breakfast bar or a huge island with a brickwork countertop, almost all designed kitchens fall into one of three main design brackets. A kitchen that is designed using warm shades of colour and natural materials such as stained wood cabinets and granite countertops is a traditional style kitchen. The ones that sport a cooler tone and flaunt minimalistic designs and sleek lines while making a stylish statement are modern style kitchen. This style of design generally has simple designs, white cabinet and stainless steel accents. Kitchens that are a gentle mix of traditional and modern designs use elements mixed and matched from both styles but while maintaining a cohesive flow in its form are the transitional kitchens. With CozyHome, make your dream come true and turn the kitchen of your choice into reality. Our talented team of designers creates customized kitchen designs and cabinets as per your specifications for your home in Toronto. Whether you have your designs mapped out in your head or not, you can discuss your tentative plans with our in-house designer at CozyHome and view your ideal kitchen in 3D that will give you a better idea of how it will look in real after renovation. A kitchen renovation is most likely going to cost a homeowner a considerable amount. However, at CozyHome, we provide our clients with unparalleled workmanship and the highest level of customer service at reasonable market rates ensuring you remain within your budget. At CozyHome, our priority is ensuring that our clients are happy. We understand the trouble homeowners have to go through while having their kitchens renovated. Hence, CozyHome promises and stands by delivering an entire remodelling project within one-to-two weeks of the confirmation. We work hard to make sure that you can start enjoying your perfect kitchen right away. Contact us for more information about our services in Toronto.